Last weekend, The New York Times reported that senior FBI officials were so concerned about whatever President Donald Trump’s true motivation for firing FBI Director James Comey was that they immediately initiated a counterintelligence investigation of the president himself. The Times reported that these officials believed that Trump may have intentionally or unwittingly played into the Kremlin’s hands by firing Comey so as to impair the FBI investigation into what efforts, if any, Russian intelligence personnel undertook in attempting to influence the 2016 presidential election and what role, if any, the Trump campaign played in facilitating those efforts. And he told Lester Holt of NBC News that he fired Comey because he would not shut down the FBI investigation into the Russian behavior during the 2016 campaign and would not drop the prosecution of his former national security adviser, retired Lt. Gen. Michael Flynn. It is the reasons he gave to Holt that, according to the Times piece, impelled senior FBI officials to believe that the president himself might be a national security risk. Can the FBI investigate the president? In a word: Yes. Here is the back story. The FBI conducts generally two types of investigations — criminal and counterintelligence. Criminal investigations are intended to find the people who have already committed particular crimes, with agents lawfully and constitutionally gathering evidence against them under the supervision of a federal prosecutor and in conjunction with a federal grand jury. A counterintelligence investigation is aimed at shoring up national security by looking at people who may be breaching it. This type of investigation often involves surveillance of the suspected people. A national security breach is any event — criminal or not — that may have enabled foreign enemies to acquire classified secrets or influence government decisions. 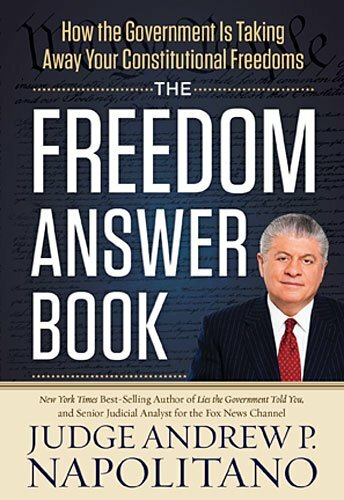 The Freedom Answer Boo... Andrew P. Napolitano Best Price: $3.03 Buy New $6.74 (as of 06:35 EDT - Details) The origins of criminal and counterintelligence investigations are often murky and at times inscrutable. There are two legal standards for commencing any investigation of anyone. The first is “articulable suspicion.” That is a low standard that requires no hard proof of criminal behavior or national security breaches, but it is generally understood to mean that there are reasons that can be stated for employing government assets to investigate a person’s behavior and that the reasons are rational and consistent with similarly situated investigations. The other requirement is that the articulable suspicion be accepted by a prosecutor, as the FBI alone cannot commence any investigation. Of course, FBI agents can chase a kidnapper without getting a prosecutor’s approval. But in a white-collar case — when the target of the investigation does not present an immediate danger to the public and the evidence of the target’s criminality or interaction with foreign governments is not generally known — FBI agents must present the reasons for the commencement of their investigation to prosecutors, who may approve and authorize or decline and reject the investigation. In the case of any FBI-harbored articulable suspicion about the president of the United States — for criminal or counterintelligence matters — my own view is that the Times story is probably accurate. If so, only Deputy Attorney General Rod Rosenstein could have authorized this counterintelligence investigation of Trump. 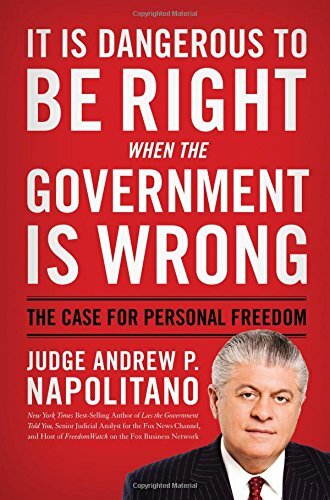 It Is Dangerous to Be ... Andrew P. Napolitano Best Price: $1.81 Buy New $4.95 (as of 07:20 EDT - Details) Whatever this investigation was — and for whatever purposes it was commenced — it was relatively short-lived in the hands of those FBI officials who suspected Trump’s motivations. That’s because Trump fired Comey on May 9, 2017, and Rosenstein appointed Robert Mueller as special counsel to conduct an independent investigation of alleged Russian influence in the campaign and any Trump campaign compliance just eight days later, on May 17, 2017. At that moment in time, Mueller and his team assumed whatever investigation the FBI and Rosenstein had commenced of Trump and the then-1-year-old investigation of the Russians and the Trump campaign that had begun in the Obama administration. At the same time this was going on, the FBI secured surveillance warrants of various Trump campaign officials from the Foreign Intelligence Surveillance Court. This use of the Foreign Intelligence Surveillance Act — which theoretically is limited to counterintelligence investigations of foreign agents in the United States — constituted an end run around the Fourth Amendment. Stated differently, the Fourth Amendment requires probable cause of crime in order to obtain a surveillance warrant, but FISA only requires probable cause of communicating with a foreign person in order to get the same warrant. Why should anyone care about this? The dual purpose of the Fourth Amendment is to protect personal privacy in persons, houses, papers and effects, as well as to compel law enforcement to focus only on those people as to whom it has probable cause of guilt. When the feds can bypass these profound requirements, they are violating and rejecting the dual purpose of the amendment, which they have sworn to uphold. FISA warrants are general warrants. General warrants basically authorize the bearer to search where he wishes and seize what he finds. One FISA warrant authorized surveillance of all 115 million Verizon customers. General warrants were the totalitarian practice of British officials in Colonial America, and the Fourth Amendment was enacted expressly to prevent them. Trump is correct when he argues that FISA has corrupted and seduced some FBI officials and agents into violating the Constitution — yet they keep getting away with it. The insatiable appetite of government officials to spy in violation of the Constitution has infected the rule of law. If they can do this to the president, they can do it to anyone. 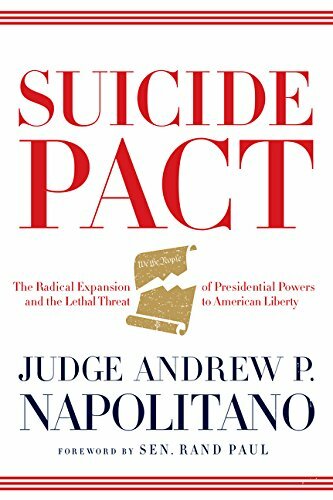 Previous article by Andrew P. Napolitano: Can the President Alone Build a Border Wall?